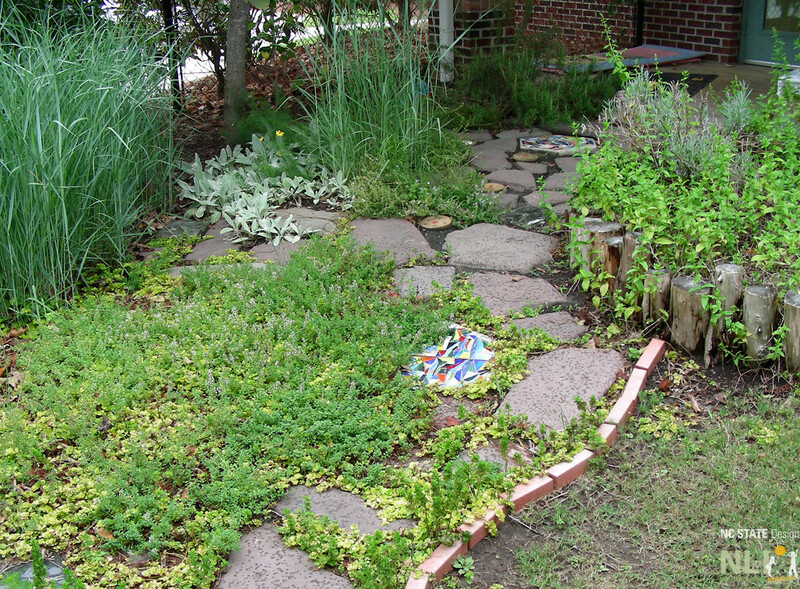 Sensory gardens provide intimate spaces where young children can be immersed in the scents, textures and colors of plants and related elements. Along with specially selected plants, sensory gardens may also include elements such as wind chimes, wind socks, flags, and children’s art. 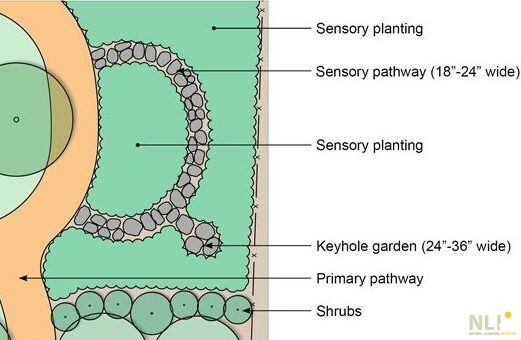 Two popular forms of sensory gardens are sensory pathways and keyhole gardens. 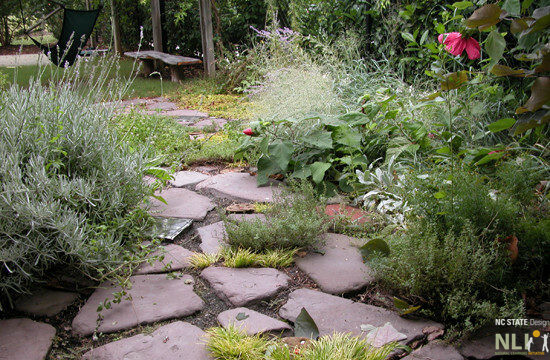 Sensory pathways can be constructed of smooth, flat, stepping stones or tree cookies with gaps wide enough for in-between planting. 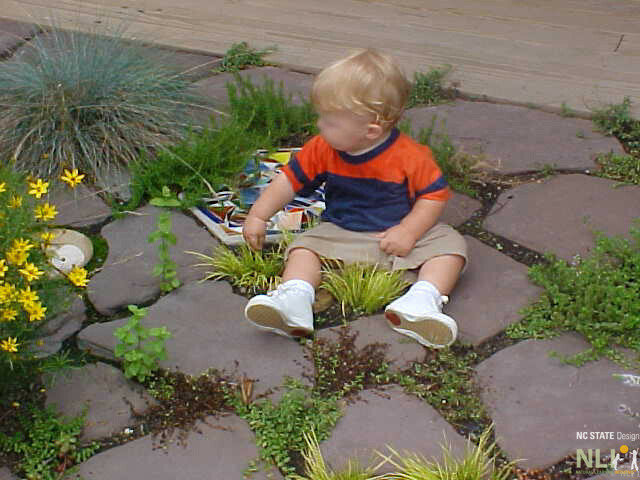 Stepping stones can be natural stone or concrete or made by children to include hand prints, leaf prints, shells, marbles, colored tile mosaics, or smooth glass. Glass blocks or clay bricks can be laid in the sensory pathway to add additional sensory richness and variety. Sensory pathways should be considered part of the larger pathway system and should not dead end. They can be installed as a narrow (18″-24″), short loop off the primary pathway (Figure 1) or a broad (36″-72″) connection between settings (Figure 2). Wide, sensory pathway of flat, smooth stones, with hardy, fragrant, “step-able,” in-between plants. Sensory pathway lined with a variety of sensory plantings and elements. 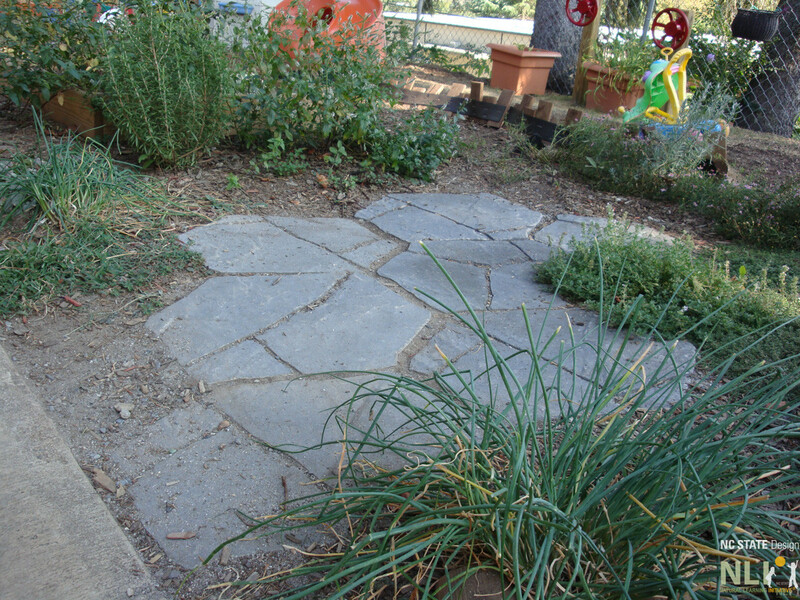 Keyhole garden constructed of concrete stepping stones at YWCA of Asheville Child Care Center. 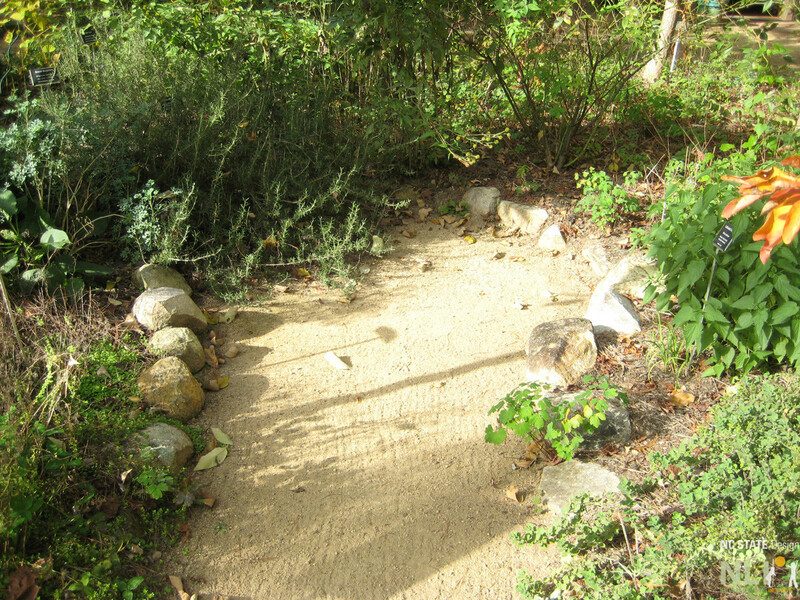 Keyhole garden surfaced with fine crushed stone and edged with smooth stones at the NC Botanical Garden, Chapel Hill, NC. Keyhole gardens provide an intimate space to rest while immersed in sensory plants. Keyhole gardens are shaped like a skeleton keyhole with a narrow entry and bulbous, interior space wide enough for a young child or two to sit and reach the plantings on either side (approximately 24” – 36” wide). Keyhole gardens can be installed as a subspace along a sensory path or be designed as a stand-alone setting. For more information on pathways, check out the rest of the Green Desk pathways posts. Figure 1: Sensory pathway as a short loop off primary pathway. Keyhole garden added along sensory pathway. Figure 2. This wide, sensory pathway connects the classroom porch to a vine-covered pergola.